It is now possible to have very effective music lessons online for trumpet, trombone, French horn, euphonium, and tuba! All you need is a recent model computer, a quality webcam with microphone, and a high speed internet connection. During thousands of hours of online instruction, Bruce has mastered and streamlined this new medium, enabling his private brass students to smoothly interact with him, even though many live thousands of miles away. Recent advances in technology have yielded extremely clear audio and video quality. You and Bruce will view a very clear, full screen image, which along with his high-end headset, allows Bruce to easily detect and correct any issues you might be having. His online students make progress just as fast as his in-person students. 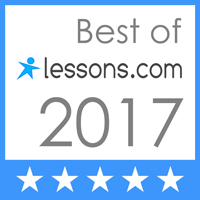 People are always amazed at how well the online lessons work! Virtually every student (over 99%) that has tried a Skype lesson with Bruce has gone forward with the lessons! Bruce will guide you in selecting a webcam and with the Skype set-up if you need help. No lesson time is wasted setting up, packing up, coming in or going out. Great teaching is available to all! Would you like to move your playing ability to a whole new level? Brass playing is easy when it is done correctly! The secret is in knowing what to practice, how to practice, and when to practice. At each lesson, Bruce will carefully guide you through a series of routines specifically designed to develop every facet of your playing: upper register, endurance, accuracy, technique, flexibility, music reading, you name it. Regardless of your abilities or the problems you are currently facing, Bruce’s time-tested brass teaching techniques will bring you solid improvement! Bruce’s many years of study with the world’s best, coupled with years of performance experience in some of the most demanding situations, all attribute to the success he has had in his 37 years of brass teaching. From trumpet to tuba, Bruce’s students have benefited greatly from his teaching. Each lesson is custom tailored to address your needs as a player, with emphasis upon building the physique you need to play correctly and easily. Most brass players suffer from a lack of basic physical development on their instrument and as a result, struggle to play. You do not have to accept mediocrity. Start lessons now and watch your frustrations begin to diminish! $32.50 per 30 minute private lesson held every week. $130.00 per month. Recommended for beginner to intermediate level students. $65.00 per 60 minute private lesson held every other week. $130.00 per month Recommended for intermediate to advanced level students. Payments are made monthly and can be made by personal check or PayPal.